While a traditional masonry fireplace is high in aesthetics and beauty, they are rather useless for actual heat. If you need heat for your home and have an existing masonry fireplace, you can utilize a fireplace insert. A fireplace insert is a closed-combustion firebox that is installed into an existing fireplace to increase efficiency. 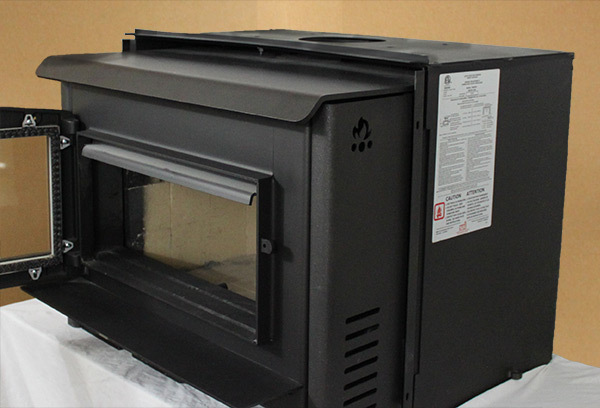 You literally "insert" the unit into the old fireplace and instantly upgrade its efficiency and heating capabilities. Inserts are available for burning wood (or wood pellets) or for burning gas. Gas inserts can be direct vent, natural vent or vent-free. Almost all inserts come standard with a blower, though with some, it is an optional addition to your fireplace insert installation. The use of the term "insert" can be confusing, as many use it interchangeably when referring to inserts and zero clearance manufactured fireplaces. These are not the same thing, as the zero clearance units can be installed into a wall or framed into a mantel cabinet, while inserts can only install into a preexisting fireplace. As a result, we have two separate and distinct categories for these units here on eFireplaceStore.com—one for "Fireplaces" and one for "Fireplace Inserts." A fireplace insert is a closed-combustion firebox that is installed into an existing fireplace to increase efficiency. If a fireplace insert is an option you are considering for your home's needs, we hope that our Fireplace Insert Buying Guide is a helpful tool as you search for a fireplace insert to fit your needs. This guide covers everything from fuel type, sizes, styles, venting, and cost. The vast majority of fireplace inserts are installed into masonry fireplaces, although there are some manufactured (factory-built, sheet metal) fireplaces that are listed to accept an insert. If you have a manufactured fireplace, you can refer to your owner's manual to see if your manufactured fireplace can accept an insert, and if it can, how to install an insert. Additionally, some inserts are not listed for use within manufactured fireplaces, and this information is listed in the owner's manual. If either the manufactured fireplace or the insert is not listed for use with the other, then the installation will not work correctly. One thing to consider as well is the local codes concerning hearth appliances. You should consult your local code enforcement office to see what the rules are for the installation of a fireplace insert into your existing hearth. Once you have determined if you can utilize an insert, you need to determine what size of insert you need. The first thing you need to know are the dimensions of your existing fireplace. You will need several numbers, so grab a tape measure and get to measuring. First, you need the height and width of the front opening of the fireplace. Then, you need to know how deep the fireplace opening is. Additionally, you need to know the height and width of the back wall of your fireplace. The first thing you need to know are the dimensions of your existing fireplace. Now that you know the size of your existing fireplace, you can start to look at sizes of inserts to get an idea of what sort of insert you might like to have in your home. Since inserts are made to be able to fit inside most fireplaces, you should be able to find an insert that will fit inside your fireplace, unless it is unusually small. We do have a variety of sizes available across the wood, gas and pellet spectrum, so chances are we will be able to find one that will work for you. One of our most popular gas inserts, the Empire Innsbrook insert (available both in direct vent and vent-free) is made in three sizes — small, medium and large — to ensure compatibility with both small and large fireplaces. Our wood-burning inserts range in size from the petite Napoleon 1101P insert to the largest wood-burning insert we sell, the Osburn 2400. 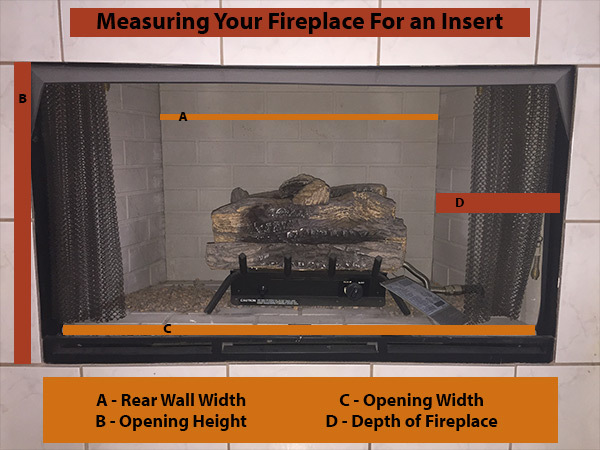 Since almost all fireplaces are different, your exact opening size will determine the appropriate flashing or surround to accompany your insert. The flashing or surround will cover the area where the insert meets the edge of the preexisting fireplace, and cover any unsightly gaps. Some manufacturers offer decorative surrounds and flashings to match their inserts. For example, instead of a basic black sheet metal flashing, some models provide the option to go with a cast iron surround. If aesthetics are important to you, be sure to check out all the available flashing and surround options for each model before making a decision. In the rare situation where none of the appropriate flashings or surrounds will cover your entire fireplace, such as situations with larger than average fireplaces, you can buy just the insert so you can have a custom surround fabricated by a local metalworker. As always here at eFireplaceStore, we are happy to help you find the appropriate flashing or surround or to let you know that you will need to have a custom surround made. As we have mentioned earlier in this guide, fireplace inserts come in three fuel types, gas-burning, wood-burning, and pellet-burning. Each of the three fuel types have benefits, but each also have disadvantages as well. Sales numbers confirm that gas-burning inserts are the more popular option among fireplace inserts. The rising cost of wood appliances, lack of wood availability, and the declining cost of fuel gas has shifted the favor of the marketplace to the gas hearth appliances. With gas-burning inserts, you are going to get the highest level of efficient heat output. 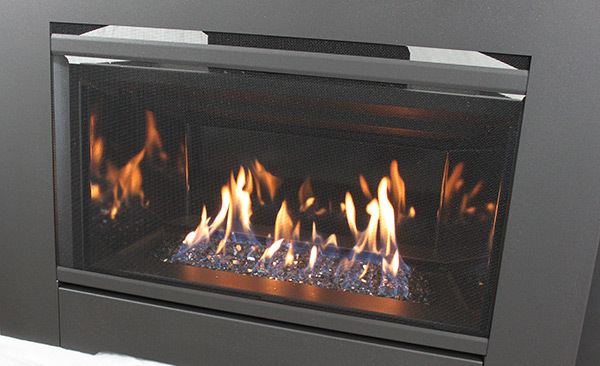 The primary advantage of a gas burning insert is the ability to control the fire with a remote control. Gas inserts come "remote-ready," though in almost all cases the remote control must be purchased separately. In most cases, you will have a few different remotes from which to choose. These various remotes will offer a few different functions, ranging from the basic on/off control to the ability to set and operate via a thermostat. Most remote-ready models also work with a wall-mount thermostat control. The primary advantage of a gas burning insert is the ability to control the fire with a remote control. For some customers, the combination of efficient heat output and remote control of the insert is the deciding factor in a gas fireplace insert purchase. For others, it is the ability to have a fire without all the work that goes into splitting wood or hauling pellets. The disadvantages to gas fireplace inserts are primarily in the controls. Some cannot be lit in the case of a power outage, or simply won't work. Other models feature a battery backup that allows operation in the event of a power outage, but these batteries are often forgotten about until a power outage makes them necessary, leading to a scramble to find the properly sized batteries. Gas fireplace inserts come in three styles: vent-free, direct vent, and natural vent. Each type of venting has advantages and disadvantages, and they each have their own rules and regulations. Direct vent gas fireplace insert are by far the most common; this is partially due to the restrictions on vent-free appliances and the scarcity of the natural vent appliances. Direct vent inserts are also an excellent choice for customers with homes that have been retrofitted with very tight insulation, resulting in a limited amount of oxygen to supply a naturally drafted system. The combustion chamber is sealed with a solid pane of tempered or ceramic glass and, since all combustion air is drawn in from the outdoors and all combustion gases are exhausted to the outdoors, there is zero air exchange with the home. So if an existing, leaky hearth is causing heating costs to rise, adding a direct vent gas insert can almost eliminate this headache. Direct vent inserts also release minimal emissions into the atmosphere for those who are environmentally conscious and are safe to install in every state and province. Because many of these systems may be operated with a remote, wall switch or thermostat, they are an excellent choice for customers who want convenience and ease of use. Gas fireplace inserts come in three styles: vent-free, direct vent, and natural vent. Each type of venting has advantages and disadvantages, and they each have their own rules and regulations. Venting your direct vent gas insert is fairly straightforward, though you will want to make sure you follow the instructions that the manufacturer lists in the installation manual. Direct vent inserts utilize a co-linear, or side by side, venting system. One pipe brings in the air for the fire, and the other pipe takes the exhaust fumes back out. Direct vent inserts utilize a co-linear, or side by side, venting system. One pipe brings in the air for the fire, and the other pipe takes the exhaust fumes back out. The top plate turns this co-linear pipe set into a single pipe within a pipe unit, allowing the direct vent inserts to utilize the same variety of termination caps that are commonly used with other gas hearth appliances. Some manufacturers will produce insert-specific liner kits, designed to work with certain inserts, which includes all of the components needed in various lengths. Other manufacturers will allow you to use liner components produce by one of the major chimney manufacturers. In either case, you do not have to be exceedingly accurate with your measurements. These venting kits are sold in length increments, meaning you only need the overall height of your chimney to choose which kit that you would need. Often, these lengths are 15', 20', 25', and 30'. If you need more than the amount included in one of these kits, you will need to order additional liner and 2 x aluminum flex connectors in the appropriate diameter to extend the liner. It is imperative to pay very close attention to any manufacturer-specific instructions included in the installation manual for the actual insert. Not following these instructions may result in the insert malfunctioning, a voided warranty and, most importantly, a chimney fire or carbon monoxide poisoning. If you have any doubts, it's better to contact a professional for their expertise prior to ordering or planning your installation with any and all questions you may have. The cost of a gas fireplace insert, including the purchase of the insert, the installation, and any necessary venting, can run from $1,500 to over $4,500. The cost of gas fireplace inserts can vary wildly due to installation costs. 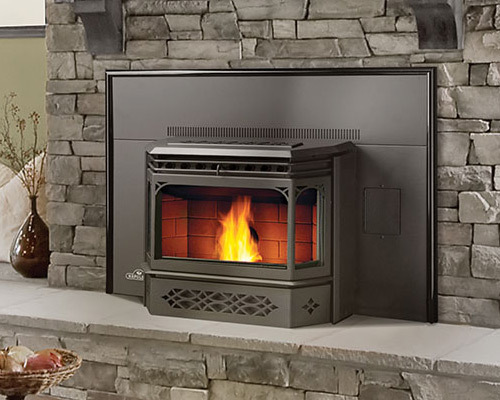 The lower end of the range assumes that your existing fireplace is in good condition, you have already got the gas line to your fireplace, and that you are installing a vent-free unit which won't require any venting components. The upper end of the range assumes a direct vent gas insert that will require a co-linear vent system to be installed, possible custom termination flashing or modifications, as well as routing of a gas line from existing gas infrastructure within the home. The cost of a gas fireplace insert, including the purchase of the insert, the installation, and any necessary venting, can run from $1,500 to over $4,500. The authenticity of a wood fire cannot be beat, and a wood-burning insert is still a popular option. If you have access to plenty of wood, or are looking for the highest amount of heat for your home, or are often without power, a wood-burning insert is a good choice. Nothing can match the warmth from burning quality firewood, and many of our inserts can provide primary heat for your home. If you have access to plenty of wood, or are looking for the highest amount of heat for your home, or are often without power, a wood-burning insert is a good choice. When searching for the right wood-burning insert, one of the most important considerations is the size of the firebox chamber. Most of our inserts list the ideal log size on their respective item pages (usually under the "Features" section), but if you need assistance finding what size logs will fit in any insert, we will be happy to assist you. In almost every case, this information can be found in the downloadable owner's manuals, also on each insert's item page. Admittedly, the savings of wood over gas heating can vary. It depends entirely on when you would buy the firewood for your wood-burning insert. If you buy your firewood in the offseason, you will get the lower prices for your wood. If you were to buy the firewood in the season you need it prices might be as high as half a grand. It entirely depends on when you buy your firewood as to how high your savings are. One of the major disadvantages in wood-burning appliances is the rising costs of the wood-burning industry. From the appliances to the rising cost of the wood itself, the startup cost of choosing to go with a wood-burning insert might be a significant factor in the decision. Wood inserts perform best when installed with a properly sized rigid or flexible chimney liner from the appliance vent collar to the chimney termination. Flexible venting is the most commonly selected method for wood burning inserts and must be a minimum grade of 304 stainless steel, with 316 stainless being preferred. Flexible liners must meet the requirements of the insert manufacturer and be rated to the UL1777 standard. Typical flexible liner installations will consist of a rigid appliance adapter with a separate or integral gear clamp, the flexible liner itself, a top support plate with clamp, and a cap and storm collar. Not all flexible liners are created equal, and many will range in thickness from .004 to .006. While this may not sound like much of a difference, the effect on long-term durability is substantial. There are also several different joint types, including crimp, rolled, and welded. Low-cost liners use crimp type joints that are semi-flexible but can separate over time and may not always be gas tight. High-quality liners will utilize rolled or welded seams, which are both flexible and durable. They are also gas-tight and safer in the event of a chimney fire. Not all flexible liners are created equal, and many will range in thickness from .004 to .006. While this may not sound like much of a difference, the effect on long-term durability is substantial. Many installations also require that the liner is insulated. Wrapping the flexible liner in insulation ensures higher flue gas temperatures are maintained. Without insulation, liners installed in cold climates can lose much of their heat through thermal radiation. This can result in the loss of flue gas buoyancy, resulting in an appliance that does not draft properly. If the manufacturer does not specify on liner insulation, it is a general rule to insulate the liner if installing it into an interior chimney that could hold 3 liners or an exterior chimney that could hold 2 liners. Essentially, if you could fit more than 2 flexible liners into your interior chimney, or more than 1 flexible liner into your exterior chimney, you should probably insulate the flexible liner. The other installation type for wood burning insert venting uses rigid liner sections. While more costly, the rigid liner sections are typically factory insulated and seal very well. The sections will either screw together or utilize a lance and dimple system. Quite literally, think of how a Swiffer mop assembles; you match the two pieces together, slide one into the other and twist to lock it in. Even if the system does utilize the twist and lock system, at least one screw per section should be used to ensure the liner sections do not separate in the event of a rotation of the liner or, even worse, in the event of a chimney fire. Using a rigid chimney liner is a bit more challenging than a flexible liner, as the excess cannot simply be cut off. Exact measurements for each portion of the liner routing must be taken. The liners must also compensate for offsets, narrow areas, and a specialize termination at the top of the chimney. To summarize, rigid liner systems require more planning than flexible systems, but they eliminate the need for field installed insulation and are more durable than their flexible counterparts. The cost of a wood-burning fireplace insert, including the purchase of the insert, the installation, and the necessary venting, can run from $1,800 to over $6,400. This range is in both the venting and installation costs, as well as the cost of the inserts themselves. 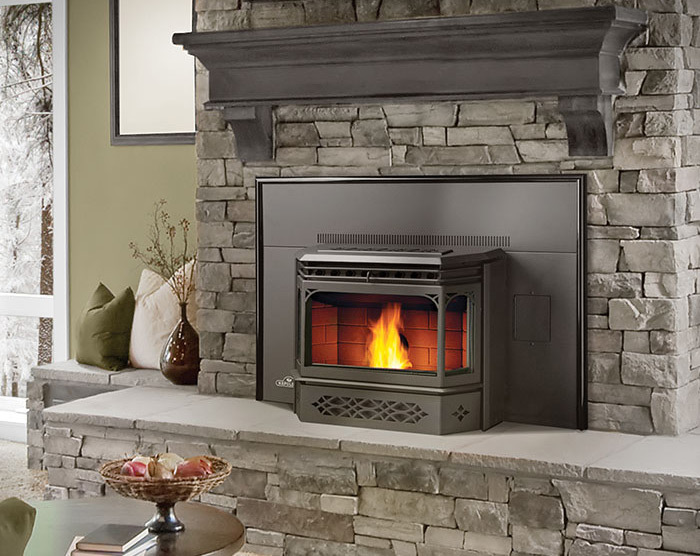 The lower end of the range assumes that the receiving fireplace is in good condition and that the chimney and fireplace need no service before installation. The lower end also assumes that the chimney is the correct height, is roughly 15 feet (of 304 flex liner with crimp seams) in length, and will be easily terminated using no custom parts. The higher end of the range assumes that the fireplace and chimney need some maintenance, the termination might need some custom fabrication, and up to 30-35 feet of 316 alloy liner with welded seams for the chimney. The cost of a wood-burning fireplace insert, including the purchase of the insert, the installation, and the necessary venting, can run from $1,800 to over $6,400. Pellet systems are a great choice for customers who want efficiency and a very low heating cost. When compared to the cost of a gas system, pellet heating is a fraction of the price. When compared to wood burning, pellet heating is cleaner-burning and when compared to the efficiency of pretty much anything out there, pellet hearth systems beat wood and gas heating by a mile. Pellet fuel is manufactured for the intended purpose of providing efficient heating. It is quality controlled and tested, with the final product being prepackaged bags with a label showing precisely what is inside, so pellet fuel does not offer the variables to consider with even the best wood burning practices. A Pellet-burning insert utilizes pellets for fuel, fed to the fire by an automatic auger, as such, they do require electricity to operate. Though, some models have a backup battery feature to allow operation in the event of a power outage. Pellets are harder to find than other fuel sources but are becoming a little more common. 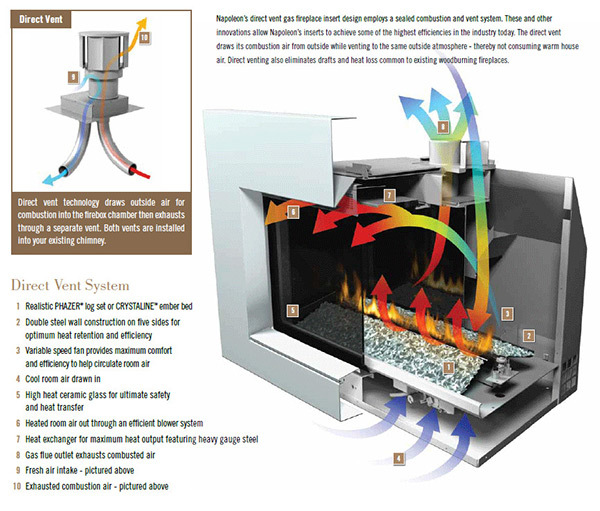 Pellet-burning inserts are considered to be the most eco-friendly of the available fireplace inserts, as the pellets can be made from sawdust, wood, bark, other wood byproducts, corn kernels, soybeans, nutshells, barley, dried cherry pits, beet pulp, wheat, and sunflowers. On the other hand, while they are far more eco-friendly than gas fireplaces or gas fireplace inserts, they are a bit high maintenance. This high maintenance side is due to their need for constant attention to ensure optimum performance. Pellet inserts also have quite a bit of a learning curve for the inexperienced user and do require maintenance for sound operation. Each insert offers different heat levels and fan speeds. Experimentation is needed to achieve the best results. In summary, they are still a very efficient, low-cost option for customers who want to add maximum efficiency to their inefficient wood hearth. With pellet systems, venting is not as simple as taking a rough measurement of the total height of the chimney, ordering more than needed and simply cutting away what isn't used, as it depends on the type of liner you choose. If you choose to use chimney liner to vent your pellet insert, they are typically approved to use 4" diameter chimney liner that is stainless steel and listed to UL 1777, which is the same listing for liner used when relining a chimney for use with a wood insert. 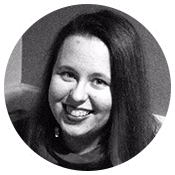 If you do choose to go this route, it would indeed be relatively straightforward and would involve ordering more than needed and cutting away what you do not use. There are no manufacturer-specific liner brands you have to use, so long as the proper diameter is used, the liner is listed to UL 1777 and is constructed of stainless steel. You need a top plate, cap, clamp and storm collar from the manufacturer of your choosing. Most manufacturers require the flexible venting run to commence with a tee for both cleanout purposes and vertical orientation of the venting system. After installation of the tee, an adapter is typically used to transition to flex pipe for the remainder of the run. With pellet systems, venting is not as simple as taking a rough measurement of the total height of the chimney, ordering more than needed and simply cutting away what isn't used, as it depends on the type of liner you choose. If you were to choose a Type PL pellet system, there is no flexible stainless steel liner to cut. Type PL venting is offered with flexible stainless sections, but each end of this liner commonly has a twist lock section for connecting to PL venting with these same twist lock connections. This typically 10' section is just meant to pass through the damper and smoke shelf to reach the vertical chimney where rigid twist lock sections extend to the top of the chimney, so pretty accurate measurements are needed. Adjustable lengths are available to accommodate any measurement. However, some pellet vent manufacturers may also offer flexible lengths to cut for use with flex adapters that do twist lock to their rigid sections, so there are several different routes to choose from when relining a chimney for use with a pellet insert, each with individual methods for installation. A final consideration is bringing in outside air as this may be required when installing a pellet insert into a mobile home and is something that is always recommended. If relining a masonry chimney, an outside air kit including components needed may be used, but this would only include a short length of smaller diameter aluminum flex ducting as these kits are meant primarily for freestanding stove applications. You can extend this (typically 2" diameter) ducting using locally-sourced HVAC ducting (dryer vent ducting) to reach the chimney cleanout. If you have to extend the outside air to the top of the chimney which would be common with mobile home installations or any installation into a factory built fireplace, the installation manual for your insert covers this topic and provides specific instructions with materials to use. In some cases, adapter components need to be fabricated from galvanized steel sheeting. Termination components can often be built using 2" PVC piping. Each manufacturer is different, and it is important to follow their recommendations. The cost of a pellet-burning fireplace insert, including the purchase of the insert, the installation and the necessary venting, can run from $3,000 to $5,000. This range is predominantly in the installation, due to the electrical needs. The lower end of the range assumes that the existing fireplace and chimney are in good condition and that there is an electrical source nearby. The lower end of the range also assumes that the chimney does not need to be lengthened and that you need only up to a 15 foot run of 3-inch 304 alloy stainless steel chimney liner. The higher end of the range includes the need for electrical relocation to power the insert, service to the existing fireplace and chimney, and the possibility of an outside air kit to be installed. The higher end of the range also assumes that you would be using up to a 35 foot run of a 4-inch venting system. The cost of a pellet-burning fireplace insert, including the purchase of the insert, the installation and the necessary venting, can run from $3,000 to $5,000. With your insert in mind, insulation is highly recommended for wood burning and pellet inserts, but not required unless building code or the manufacturer specifically state as such. The rules are this — For an interior chimney (within the building envelope), the liner must only be insulated if the chimney flue is greater than 3 times the area (cross-section, not total area) of the chimney liner area. For an exterior chimney, the liner must be insulated if the chimney area is 2 times the area of the liner. All this being said, many customers will choose to pass on the insulation to save money, only to have the installation completed and find the system does not draw properly because of low liner temperatures, causing them to have to pull the liner out and insulate it after the fact, adding to the total cost. In summary, each fireplace insert option has pros and cons. Pellet Inserts are extremely efficient, but exceedingly high maintenance. Gas Inserts are low maintenance, but depending on whether or not you choose vented or vent-free, your heat output changes. Wood-burning Inserts are the closest thing to a traditional fireplace but are not nearly as efficient as gas inserts. No matter your choice, eFireplaceStore is here to help you work your way through each decision involved in choosing your fireplace insert. You can always reach out to our NFI Certified Technicians, here, with your questions.